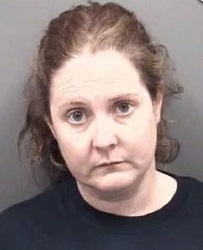 A Kannapolis City Schools teacher was arrested on a drug trafficking charge earlier this month. Elizabeth Marie Lanier, age 35, was arrested on the charge of drug trafficking after a call to police reporting that two people were being robbed at gunpoint. Lanier and her roommate were allegedly robbed by two men that Lanier had sought out to buy the drugs from. Lanier is an exceptional children’s teacher at A.L. Brown High School in the Kannapolis City Schools district. Director of Community Relations for Kannapolis City Schools, Ellen Boyd, confirmed that Lanier has been suspended while officials investigate but did not say if that suspension was paid or unpaid. Lanier has been working at the school since February 2014. Lanier is currently being held at the Rowan County Detention Center under a $10,000 bond. This entry was posted in CRIME, EDUCATION, LL1885, Quiet Epidemic and tagged Elizabeth Marie Lanier, Kannapolis City Schools, Quiet Epidemic. Bookmark the permalink.